When it comes to taking out a payday loan, the primary concern is finding a company you can trust. ACE Cash Express is a major provider of financial services in the US, with a long history in the business. They have been operating since 1968, providing fast loan services to over 38 million customers and counting. This company provides you with easy application, instant feedback on whether your request has been approved, and an amazing 72-hour satisfaction guarantee. This means that you can change your mind about the loan within the first three days and return the money you received with no additional expenses, which is reason enough why you should consider this company when thinking about getting a payday cash loan. Keep reading our ACE Cash Express review to learn more about this company’s offer. When it comes to online payday loans, ACE Cash Express provides lending services to customers in California, Florida, Idaho, Kansas, Louisiana, Minnesota, Ohio, and Texas. If you wish to apply in one of their stores, you can do so in the following countries: California, Florida, Indiana, Kansas, Louisiana, Minnesota, Missouri, New Mexico, Ohio, Oregon, South Carolina, Tennessee, Texas, and Virginia. In Ohio and Texas, where ACE Cash Express is not a direct lender, customers can use their services in order to get matched with a third party lender. You do not have to be employed, but you must have a steady source of recurring income to ensure you will be able to repay your loan. Apart from having a steady income, customers who wish to use this company’s services need to fulfill several requirements. First of all, you need to be at least 18 years old and reside in the state where you wish to apply. Online applicants need to provide a valid phone number in order to enable verification of their application information and possess a checking account opened at least a month prior to application. ACE Cash Express does not offer loans to debtors in bankruptcy cases (or those who plan to file for a bankruptcy relief) and members of the Army, Navy, Marine Corps, Air Force or Coast Guard serving on active duty or dependents of members of the Armed Forces serving on active duty. The amount you can borrow varies in accordance with state laws and depends on whether you choose to apply online or in one of the company’s stores. In general, the amounts range from $100 to $1,500. As mentioned previously in this ACE Cash Express review, the advantages of this company include almost half a century of experience in the lending business, the possibility to give up on your loan up to three days after you received the cash, and instantly finding out if you are eligible for a loan. Applying for payday loans with this company is easy and fast, as we suggested at the beginning of this ACE Cash Express review. First, you need to select your state of residence and make sure that their lending services are available in that particular state. After you fill out the simple and secure application form (it should take no more than a couple of minutes) and submit your information, you will get an instant response about your eligibility. If you get a positive response, once your application information is verified, you will be able to either pick up the cash at the nearest ACE Cash Express store, have it deposited into your bank account overnight or get the chance to choose between these two options in case they are both available in your state. Since it is necessary for the company to verify the information you provided before you receive the loan, the amount of waiting time before you have cash in your hands depends on how easy it is to verify them, but this should not take more than one business day. In case you live near an ACE Cash Express store, you can apply there as well and all you need do is bring a valid photo ID, proof of income, and a bank checking account (the documents that count as proof differ depending on the state). If you apply for a loan online, the total amount you are required to pay back will be deducted from your bank account on the due date. If you apply in a store, you will have to come in and make the payment in person on the due date or earlier. If you do not repay your loan on time, you may be charged a late fee and an additional returned item fee for all checks that return unpaid. The company has the right to contact you via phone, mail or email and request payment and exercise other rights as a lender. If you still fail to repay your loan, they can sell your debt to a third-party buyer or have a collection agency do the work for them. Not paying back your loan on time does not affect your credit score with the major bureaus, including Equifax, Experian, and TransUnion, but it does influence your rating with other, alternative agencies such as FactorTrust. Refinancing is not available in all states and includes new transaction agreements you should review before signing. While researching for this ACE Cash Express review, we tried to find out how much money exactly you need to return if you opt for a payday loan. There are three major factors that shape the final amount: the laws in your state of residence, the amount you borrow, and the APR that depends on whether you choose the monthly or bi-weekly pay schedule. For example, if you borrow $100 in California, you pay a fee of $17.64. The bi-weekly APR is 459.90% and the monthly APR is 214.62%. 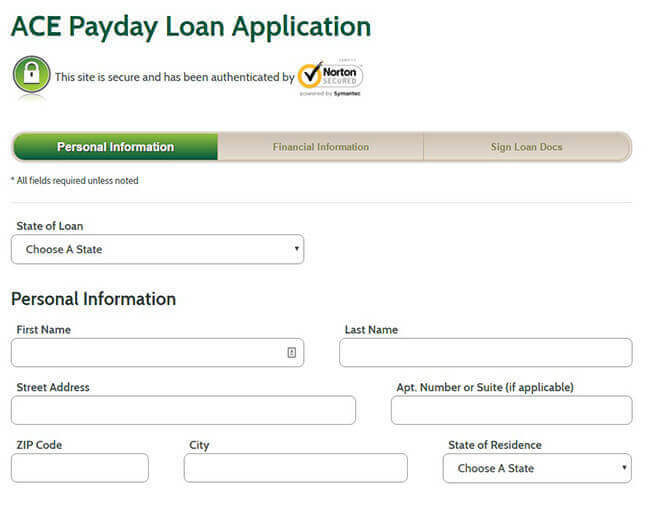 The fee is twice as high ($35.28) for $200 payday loans. There is also an additional $15 fee (and potentially other NSF fees determined by your bank) in case the check or ACH gets rejected or returned. The situation is a bit more complicated in the states where ACE Cash Express is not a direct lender, such as Ohio and Texas. Therefore, if you borrow $200 in Ohio, the bi-weekly APR climbs up to 807.04%. Once you include lender interest, lender credit investigation fee, and CSO fee (since the company operates as CSO in Ohio, not as a direct lender), the total amount of check with interest and fees is $261.91, in comparison to $235.28 in California. If you do not pay on time, that is, within 10 days after the payment was due, there is an extra fee of 5% of the total amount or $15.00 (whichever is greater) and a dishonored item charge amounting to $20 in case ACH debit is dishonored by your bank. Like other companies that offer cash payday loans, ACE Cash Express charges large fees and the APRs vary immensely. However, unlike many other companies, they offer you the chance to give up on your loan up to 72 hours after you received it, with no additional charges, which is rather generous. They also instantly let you know if your application has been approved and you get the cash as soon as your information has been verified. Therefore, if you are in need of a fast solution to your current financial problems, this company offers greater advantages than many others that are currently available. The problem that remains is that their online services are not available in many states. They are pretty fair for lenders. My application was approved as soon as I hit submit, but I don’t get why I had to wait for two days to get the cash.